Keshwal, B., Rajguru, D., Acharya, A. (2016). DBU As A Novel and Highly Efficient Catalyst for The Synthesis of 3,5-Disubstituted-2,6-dicyanoanilines Under Conventional and Microwave Conditions. Iranian Journal of Chemistry and Chemical Engineering (IJCCE), 35(1), 37-42. Balwant S. Keshwal; Deepika Rajguru; Aman D. Acharya. "DBU As A Novel and Highly Efficient Catalyst for The Synthesis of 3,5-Disubstituted-2,6-dicyanoanilines Under Conventional and Microwave Conditions". Iranian Journal of Chemistry and Chemical Engineering (IJCCE), 35, 1, 2016, 37-42. Keshwal, B., Rajguru, D., Acharya, A. (2016). 'DBU As A Novel and Highly Efficient Catalyst for The Synthesis of 3,5-Disubstituted-2,6-dicyanoanilines Under Conventional and Microwave Conditions', Iranian Journal of Chemistry and Chemical Engineering (IJCCE), 35(1), pp. 37-42. Keshwal, B., Rajguru, D., Acharya, A. DBU As A Novel and Highly Efficient Catalyst for The Synthesis of 3,5-Disubstituted-2,6-dicyanoanilines Under Conventional and Microwave Conditions. 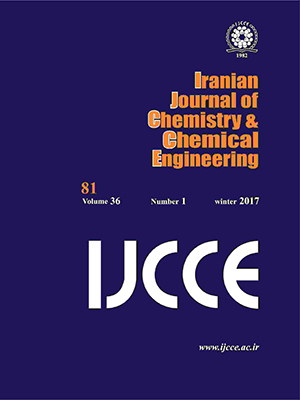 Iranian Journal of Chemistry and Chemical Engineering (IJCCE), 2016; 35(1): 37-42. 3,5-disubstituted-2,6-dicyanoaniline derivatives have been synthesized via the reaction of aryl methylene- and 1-arylethylidenemalonodinitriles using 1,8-diazabicyclo[5.4.0] undec-7-ene (DBU) as a novel and highly efficient catalyst under conventional as well as microwave conditions. Use of non-hazardous, inexpensive and readily available base catalyst, convenient procedure, short reaction time and improved product yields are some added advantages of the present protocol. Borate H.B., Kudale A.S., Agalave S.G., Synthesis of Substituted 2,6-Dicyanoanilines and Related Compounds. A Review, Organic Preparations and Procedures International, 44: 467-521 (2012). Sepiol J., Milart P., A New and Efficient Synthesis of 3,5_Diarylaminobenzenes from Arylidenemalonodinitriles and 1-Arylethylidenemalonodinitriles, Tetrahedron., 41: 5261-5265 (1985). Griffiths J., Lockwood M., Roozpeikar B., Orientation Effects in The Benzene Chromophore Bearing One Donor and Two Acceptor Groups. Electronic Absorption Spectra of The Dicyanoanilines, J. Chem. Soc. Perkin Trans. 2, 1608-1610 (1977). Prasad P.N., Williams D.J., "Introduction to Nonlinear Optical Effects in Molecules and Polymers", John Wiley, New York, (1991). Kurreck H., Huber M., Model Reactions for Photosynthesis-Photoinduced Charge and Energy Transfer Between Covalently Linked Porphyrin and Quinone Units, Angew. Chem. Int. Ed., 34: 849-866 (1995). Petty M.C., Bryce M.R., Bloor D., "Introduction to Molecular Electronics”, Oxford University Press: New York, (1995). Raghukumar V., Murugan P., Ramakrishnan V.T., A Facile One Pot Synthesis of m-Terphenyl and Biaryl Derivatives, Synth. Commun., 31: 3497-3505 (2001). Cui S.L., Lin X.F., Gang W.Y., Parallel Synthesis of Strongly Fluorescent Polysubstituted 2,6-Dicyanoanilines via Microwave-Promoted Multicomponent Reaction, J. Org. Chem., 70: 2866-2869 (2005). Milart P., Wilamowski J., Sepiol J.J., Synthesis of Di- andTriamino-l,l':3',l"-terphenyls from Arylethylidene- and Arylidenemalonodinitriles,Tetrahedron., 54: 15643-15656 (1998). Elgemei G.E.H., Elzanate A.M., Mansour A.K., Novel Synthesis of Indans, Tetralones, Condensed Benzocarbocyclic Nitriles and Condensed Pyridine-2(1H)-thiones from the Reactions of Cycloalkylidenemalononitriles with Arylmethylene(cyano)-acetamide and –thioacetamide, J. Chem. Soc. Perkin Trans.1, 1: 1073-1074 (1992). Shaterian H.R., Honarmand M., Oveisi A.R., Multicomponent Synthesis of 3,5-Diaryl-2,6-Dicyanoanilines Under Thermal Solvent-Free Conditions, Monatsh. Chem., 141: 557-560 (2010). Das P., Butcher R.J., Mukhopadhyay C., Zinc Titanate Nanopowder: An Advanced Nanotechnology Based Recyclable Heterogeneous Catalyst for The One-Pot Selective Synthesis of Self-Aggregated Low-Molecular Mass Acceptor–Donor–Acceptor–Acceptor Systems and Acceptor–Donor–Acceptor Triads, Green Chem., 14: 1376-1387 (2012). Ashry E.S.H.El., Kassem A.A., Account of Microwave Irradiation for Accelerating Organic Reactions, ARKIVOC., ix: 1-16 (2006). Elander N., Jones J.R., Lu S.Y., Elander S.S., Microwave-Enhanced Radiochemistry, Chem. Soc. Rev., 29: 239-249 (2000). Aggarwal V.K., Mereu A., Superior Amine Catalysts for The Baylis-Hillman Reaction : The Use of DBU and Its Implication, Chem. Commun., 2311-2312 (1999). Yeom C.E., Kim M.J., Kim M.B., 1,8-Diazabicyclo[5.4.0]Undec-7-Ene (DBU) Promoted Efficient and Versatile Aza-Michael Addition, Tetrahedron, 63: 904-909 (2007). Yoshida M., Komatsuzaki Y., Ihara M. Synthesis of 5-Vinylideneoxazolidin-2-Ones by DBU-Mediated CO2 Fixation Reaction of 4-(Benzylamino)-2-Butynyl Carbonates Benzoates, Org. Lett., 10: 2083-2086 (2008). Jain S., Keshwal B.S., Rajguru D., A Clean and Efficient L-Proline-Catalyzed Synthesis of Polysubstituted Benzenes in The Ionic Liquid 1-Butyl-3-Methylimidazolium Hexafluorophosphate, J. Serb. Chem. Soc., 77: 1345-1352 (2012). Rajguru D., Keshwal B.S., Jain S., Solvent-Free, Green and Efficient Synthesis of Pyrano[4,3-b]Pyrans by Grinding and Their Biological Evaluation as Antitumor and Antioxidant Agents, Med. Chem. Res., 22: 5934-5939 (2013). Xin X., Wang Y., Xu W., Lin Y., Duan H., Dong D., A Facile and Efficient One-Pot Synthesis of Polysubstituted Benzenes in Guanidinium Ionic Liquids, Green Chem. 12: 893-898 (2010).